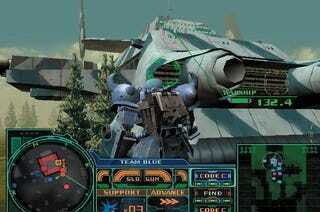 Over 14 years ago, Bandai released a little game Mobile Suit Gundam: Zeonic Front. It was different from other Gundam games because it wasn’t a fighter, you didn’t play as a Gundam, instead you played as a regular soldier in the Zeon military, specifically the mobile suit unit Midnight Fenrir. And this was one of the first works to actually give you the Zeon side of the story, the war for independence. The story of Zeonic Front is fairly straightforward. You complete mission after mission as the Midnight Fenrir, spanning a chunk of the One Year War. It starts during Zeon’s second Earth descent operation and ends with Zeons retreat from Earth. The real meat of the game is its tactical gameplay. Initially you start with two teams, designated by their colors: blue and red. Each team is led by a unique character and is very customizable. You can select what mobile suit to use, how many mobile suits are in the team(From 1 to 3. ), what type of detection system you want to start with, what weapon to use, and what kinds of support equipment you want to take into the battlefield. As you progress through the game you’ll be given new MS, new equipment, new teams, and eventually you’ll be able to send out three teams at a time rather than two. You can adjust all of this for each individual mission. The second part of preparation is setting the routes your teams will take. See, you can only control one team at a time, and even then you can only control the team leader. When you’re not controlling the other teams, they will be controlled by the AI. To ensure that objectives are completed in a timely manner and you can strategize properly, you can set routes for your squads to take and they will follow them to the letter, only deviating to chase after enemies. If you want your teams to stop at designated points without terminating the route, you can assign battle codes to them. You can set up to three battle codes. When a squad hits one of these they will stop until you issue the battle code command, at which point they will continue forward. You’ll know when they hit the code barrier because it will pop up on your HUD at the bottom. When you’re in the field you can issue other commands like “Full Speef”, “Avoid Enemies”, “Attack Enemies”, and “Halt Formation.” You can issue these commands either individually or for the entire unit. Once you have your teams selected and outfitted, and you’ve set your preferred routes, you can then jump into the mission and see how everything works out. Did you bring the right weapons? Will the AI controlled teams make it? I should probably clarify now that you can switch which team you’re controlling on the fly. The team you leave will then be switched over to the AI, which is why it’s always a good idea to give your personal team a scripted route as well for when you give up control temporarily. In fact, sometimes it’s good to just let the AI do everything because I’ve beaten a few very difficult missions only because the AI controlled teams were better at maneuvering. All of this comes together nicely to create a very tactical experience that you can shape to your liking. Once you’ve completed the main campaign, you can play New Game+, which will give you all the mobile suits and equipment you had from your clear data and ratchet up the difficulty to mix things up a bit. Zeonic Front, the game that came before Mobile Suit Gundam: Crossfire(Alt. : Mobile Suit Gundam: Target in Sight), is a true gem from thte PS2 days and I keep my disc in prime condition for when I want to play through it again. I sold it once and completely regretted it because I wanted to play it again and I will never let it go ever again. You’ll need a PS2 if you want to track down a copy of your own. Be warned that this game was remade for the PS3 as part of the MS Side Stories collection, however, it is a remake in name only. The storyline was redone and all the tactical depth was ripped out of it, making it play exactly the same as every other game in the MS Side Stories collection. It’s a pretty remake, to be sure, and it has its own merits, but it isn’t the same intense experience.